Kiteboard is a compact & feature rich board. Kiteboard can work standalone, or with an additional carrier board on top. Unlike most available boards that rely on HDMI, Kite includes a generic MIPI DSI display connector. This makes it possible to create a compact device with Kite. Kite also includes two generic MIPI CSI camera interfaces, with one of them supporting an autofocus camera (another feature missing in most boards). MIPI displays and cameras are generally difficult to deal with. The datasheets for these are generally not available. There are no standards for the connectors, so, for hardware interfacing, development of custom boards and cables is generally required. Hardware development is generally followed by the arduous task of getting the actual hardware to work. 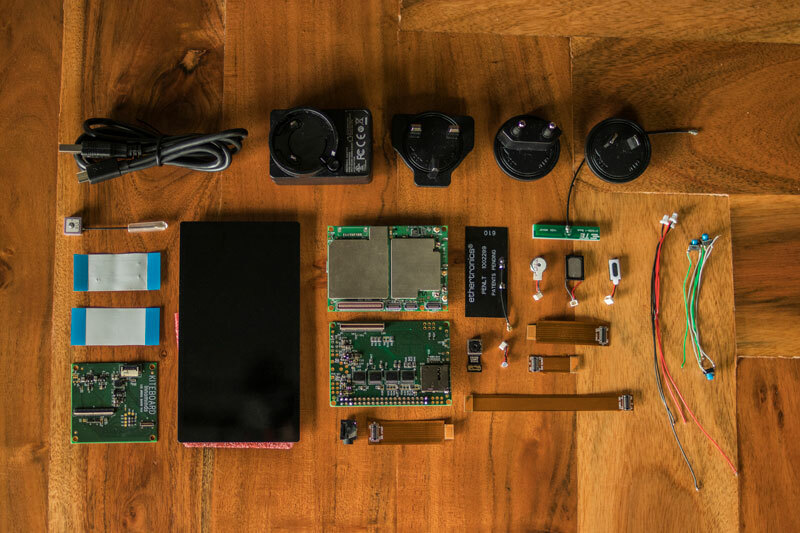 For quick device development, we have created a complete kit that makes the complete goodness of the board usable without any additional hardware/software development! A Raspberry Pi “compatibility board”. With this attached to the board, you can use Raspberry Pi HATs and pHATs with Kite. Additionally, this breaks out the audio pins (speaker, mic, earpiece, 3.5” headphone connector) and important buttons from the KiteBoard (power, volume + and -), plus a few more IO pins. Flex cables to connect the display & camera to the board. Generic push button switches (Power, Volume up, Volume down). Speaker, Mic, Earpiece, and a 3.5mm audio socket! Excited already? That’s not all – we went a step further and made things even more easier for our users. If you have access to a 3D printer, then you can use our design to put all the components together & assemble a functional Android phone!